If you are looking for information on Arizona Retirement Communities, you have come to the right place. Here, you will find some helpful information to assist you with this exciting time of your life. According to SeniorJounal.com, the fastest growing source of demand for new homes has been the result of the baby boomers. Senior Journal also reported that the age of the baby boomers is between the ages of 45 and 55, so if you are looking for retired housing communities in Arizona, they are plentiful! To give you maybe even a better idea as to just how fast this generation is growing, it is estimated that someone turns 55 about every nine seconds. Any smart home builder in Arizona has likely already tapped into the Arizona Retirement Communities industry. Hoping to retire in AZ? There are many 55 plus areas here for your convenience...let's take a look! Do You Want To Retire In Arizona? If you are seriously considering retiring in Arizona, then you will be glad to know that Arizona was actually the first state to provide a retirement community to retirees. Did you know that Del Webb (now considered Pulte Homes) started the idea of a retirement community? According to Del Web, they opened their very first retirement community on New Years Day, 1960, in a suburb of Phoenix, known as Sun City, Arizona. The overwhelming response was just the beginning of retired housing communities in Arizona and the United States. Ever since that day, retirement communities continue to pop up everywhere. Del Webb is actually now a part of Pulte Homes and are not just known to Arizona; they are also in 15 additional states. In Arizona, Del Webb/Pulte has certainly made a name for themselves and are a well known home builder. They are also very well known as one of the reputable home builders of Arizona retirement communities. Whether you prefer the big cities or a quieter community, it really doesn't matter, because you can certainly find both types here in Arizona. I know here, in Gold Canyon, you will find another one of Arizona's Retirement Communities with a very peaceful community with many, many fine attractions for you to take advantage of as a resident. My mother lives in Mountainbrook Village, which is approximately 35 minutes east of the Phoenix metropolitan area on U.S. Highway 60, and I will tell you that this is one time in my life, as an adult, that I actually wished I was a little older just to be able to buy a home in the 55 plus housing community! I am in love with that area. I live in a fairly quiet neighborhood myself in Gold Canyon. The entire area is truly a peaceful and quiet area... if you want the retired community, Mountainbrook is just one of the many nice Arizona retirement communities from which to consider. The wildlife is incredible and breathtaking at times. I have seen so much wildlife here that sometime it is hard to believe. I have seen many javelinas, coyotes, roadrunners, hawks, owls, and lizards, just to name a few. I have seen a few bobcats too... my mom has also seen a few bobcats right outside her kitchen window as well as some white-tailed deer and javalinas right in the middle of this residential area. Mountainbrook has two very large swimming pools, a jacuzzi, golf course, exercise room, tennis courts, bocce ball, activities room and so much more to keep you active and certainly entertained. Before I moved to Arizona, I was fortunate to be a guest and I just loved it there. 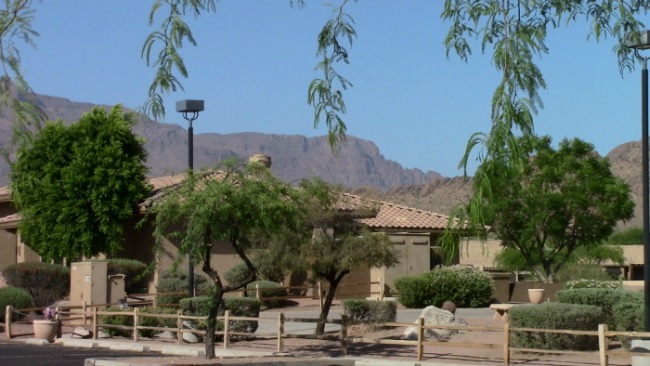 Mountainbrook Village has well over 1600 retirement homes along with casitas that are all a part of Mountainbrook Village and many of these homes have an awesome view of the Superstition Mountains and all very much a part of the Sonoran desert. There are plenty of houses just minutes outside of the retirement community as well in the same area... some of these homes have incredible views of the Superstition Mountains. Oh, if you are a real golf fanatic, you are just a couple of miles away from Arizona's number one public golf course in Gold Canyon, the Gold Canyon Golf Resort. Heck, you could ride your bike over there, taking the back roads through Mountainbrook if you wanted even more exercise...that is, of course assuming that you wanted to rent your clubs. Baby-boomers, winter visitors or snowbirds, as they are sometimes referred to, have flocked to Arizona retirement communities for many years. It should not come as a surprise why this area has been considered a prime retirement choice. There are so many reasons why this area is popular among many. First of all, you have the natural beauty of the Sonoran Desert sun along with well over 300 days a year of sunshine. If you were to ask any of the retirees already living in Arizona, they would likely tell you that another reason why they enjoy their Arizona retirement communities is because they are so conveniently located to so many of their necessary things. If the outdoors is what you are looking for, Arizona can certainly provide you an endless list of lakes and rivers which attracts so many anglers to the desert southwest. In addition, you will find just as many mountains that make up Arizona and make it the beautiful state that it is. Even Las Vegas is not that far away from Arizona! You could easily drive their in a half of a day, or take a plane. The flight is only about a 45 minute flight into Vegas. Arizona retirement communities living can be found throughout the state and not just in Phoenix. Many parts of the "valley of the sun," as the Phoenix area is often called, offers retired living at its best. It just depends on where you would like to live and if you want to live in the cooler elevations, such as the White Mountains or Flagstaff, to name a couple. Just keep in mind that in the winter, you can expect snow. Some people prefer Scottsdale over Phoenix, or maybe Tucson when it comes to the best Arizona retirement communities. Some people prefer Flagstaff or the White Mountains, both of which are considerably cooler in the summer months. What Makes These Arizona Retirement Communities So Special? Many of these Arizona retirement communities know what retirees are looking for and realize that many would prefer the active lifestyle. That's why so many of these retirement communities offer residents so many of the amenities you will see offered... golfing, swimming, tennis, recreation centers and regularly scheduled activities to name just a few. While there may be other reasons not listed here, most people will agree one of the key reasons why people find their way to retired housing communities in Arizona, is because of the active adult choices they have to choose from. The choices along with the enticing climate, make Arizona retirement communities their first selection of 55 plus areas. While there are many cities in the state of Arizona considered hot spots for retirees, do you know what the most popular retirement Arizona city is? Have you heard of Prescott, Arizona? Prescott, Arizona has a small town feel to it, which many people prefer and seems to be the most popular city to many. It is located in the cool ponderosa pines in Northern Arizona and is known to many here in Arizona, as the "Mile High" city. Conveniently located 90 miles Northwest of Phoenix, Prescott offers four very mild seasons to both the visitors and residents all-year round. Prescott has more than 6 golf courses, which is pleasing to many. Prescott is also home to the Prescott National Forest. If you like hiking, you will have well over 450 miles worth of trails to enjoy these gorgeous (and good smelling) ponderosa pines. Looking for more reasons to choose Arizona for your retirement community? How about healthcare? The healthcare is excellent in Arizona. There are many well known heart hospitals as well as other hospitals, the famous Mayo-Clinic, and a limitless list of clinics, for your healthcare needs throughout Arizona retirement communities. There's also a directory of new homes that might interest you. Some of these communities are age restricted and will be noted as such... Just click on the following link at it will take you there. New Retirement Communities in Arizona.